Fewer congregations are 100 percent white and non-Hispanic, according to the National Congregations Study. 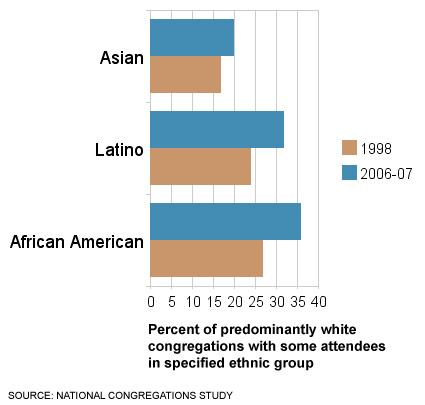 Congregations have become more ethnically and racially diverse even since 1998, according to the National Congregations Study. In 1998, 20 percent of attendees were in congregations that were completely white and nonhispanic; in 2006-07, 14 percent were. Let me be clear about what this means. We do not see significant increases since 1998 in the proportion of predominantly Latino or Asian or African American congregations in the United States. Nor do we see any significant increase in what we might call deeply diverse congregations, meaning congregations that have, say, equal numbers of blacks and whites, or a relatively equal mix of black, whites, and Asians, or a sizeable proportion of Latinos in a predominantly nonLatino, white congregation. What we do see is a significant increase in the presence of some minorities in predominantly white congregations. Fewer congregations, in other words, are 100 percent white and nonHispanic. Catholic churches are substantially more likely than Protestant churches to have some minority presence even when they are predominantly white, but the jump in minority presence has occurred in Protestant as well as in Catholic churches. Interestingly, there is no corresponding trend within predominantly black churches. Those churches are no more likely to have some whites, Latinos, Asians, or immigrants today than they did in 1998. I do not want to overstate the significance of this trend. It definitely is too soon to discard the old saw that 11 a.m. Sunday is the most segregated hour of the week. The vast majority of American congregations remain overwhelmingly white or black or Hispanic or Asian or whatever--but there also has been noticeable progress. Our congregations, like our society, are still far from a place in which color and nationality are invisible, but there has been some change in a positive direction. Somewhat like black-white intermarriage, which is increasing even though it remains rare, increasing minority presence in predominantly white congregations represents some progress, however small, in a society in which ethnicity and, especially, race, still divide us. It also is worth asking whether even a few African Americans or Hispanics or recent immigrants in a congregation might affect that congregation’s life in important ways. John Green, a Professor at the University of Akron and one of the nation’s leading experts on religion and politics, has said that congregations are easier to politicize when they are more homogeneous. Is a clergyperson with even one black family in the pews likely to talk in quite the same way about race and about social welfare issues as he would if that family was not there? Is the congregation with even one Latino family likely to approach immigration reform in quite the same way? How this increasing pluralism might be changing congregations is a subject worthy of additional research and reflection.